These are the old gates into what used to be an old goods railway goods yard at Valletort Road. It was attatched to the current main line through Plymouth at the top end of the site. The station is now the College site. The last time I visited this site building work was underway which will soon see the site dissappear under yet another bland housing development. The developer which ignored a council order to stop work on a building site where the soil may be contaminated could face legal action. "Because of the site's history it's important the soil is tested for contamination and any necessary remedial work is carried out before construction starts again." Equinox is a development of 117 apartments, penthouses and executive townhouses with properties ranging from one to four bedrooms, arranged around three cul-de-sacs, each with a selection of different house types. 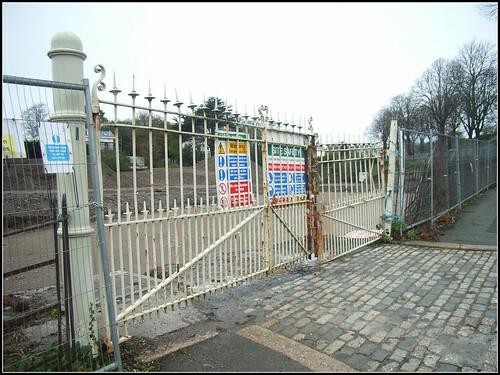 It would be nice if these old gates at least could be refurbished and saved into the development. Ambitious plans for new housing put Plymouth in line to net a share of £500million under a government drive to encourage more home-building, writes Parliamentary Correspondent Nick Lester.The Government has announced it will give cash to local authorities which produce clear plans to speed up delivery of new homes, identify suitable sites and increase housing within set timescales.Plymouth is well-placed to scoop a slice of the money with proposals for more than 12,000 new homes in the city over the next decade, and the long-term aim of having an extra 30,000 houses by 2026.